“Interdisciplinary” is ubiquitous in higher education for bundling multiple disciplines in a single environment. A growing number of institutions are hitting the sweet spot of interdisciplinarity with a new paradigm of science-based learning spaces that transcend program, pedagogy, and physical space types. Architects play a crucial role in helping institutions create spaces that allow ideas, learning, and interests to converge. Yet designing successful interdisciplinary learning spaces requires a deep understanding of evolving challenges—and opportunities—across campuses and departments. Campuses seeking to develop science-based interdisciplinary learning spaces face challenges on two fronts—cultural and architectural. Cultural Challenges – Culturally, there are many barriers to embracing interdisciplinarity. Yet the single greatest barrier to developing any campus space—and particularly interdisciplinary spaces—is funding. Leadership is often more comfortable rewarding a known entity—such as proven economically sustainable disciplines. This reinforces a cultural challenge that separates disciplines into siloes—competing for space and funding. The design process can support and encourage institutional changes, but it cannot force it. When an institution is fully committed, however, architects can provide powerful tools to create academic environments that support interdisciplinary initiatives. Architectural Challenges – Architecturally, interdisciplinary research facilities represent the “democratization” of space, where users can assemble their own personal ecosystem in a way that best functions for their work, research, and team. Democratization has an outwardly facing purpose: to put work inside the facility on display and invite in the community, other students, and visitors. Making interdisciplinary education and research transparent has the benefit of increasing recruitment and retaining students, researchers, and faculty, as well as expanding the sense of campus-wide ownership. An inclusive design process is crucial to addressing institutional goals. It is a way to break down barriers, empower leadership, faculty and students, and build consensus and a sense of collective ownership through several clear steps. The role of the architect is to help guide stakeholders and user groups through workshops, meetings, and visioning sessions through openness and collaboration. The results—project goals and guiding principles—are most successful when reached collectively. Institutional Leadership – While ensuring all stakeholder voices are heard in the visioning process, an equally important factor is strong institutional leadership. Leadership’s role is to balance power and politics with guidance and collaboration. In this dynamic, architects play a supportive role that continuously drives leadership and stakeholders towards consensus. Challenging Assumptions – Increasingly, the design process blends programming with the design of space, traditionally two separate phases, and has several benefits. First, it allows for real-time refinement of needs and goals. It also creates an opportunity to ideate new programming of space. And, importantly, it provides the designers and architects with an occasion to challenge a project’s goals, needs and assumptions, which can result in a more effective design solution and enhanced vision for the project. Architectural Patience – The complexity of interdisciplinary projects means leadership and architects must sometimes confront non-traditional challenges that come from a sudden change in users, loss of funding, or advent of new technology. The design process can be an invaluable source of both patience and certainty. As the design process creates a solid vision, the solutions used to address difficult challenges can rely on the guiding principles and goals as safeguards for the project trajectory. Keeping the solutions and goals in alignment grounds the project in a common vision in the face of unexpected challenges, and creates a foundation to tackle issues head-on. This requires a commitment to ideas, not bricks and mortars. Two recent projects—one nearing completion, another completed—reflect new directions in planning science-based interdisciplinary learning spaces. University of Kentucky Research Building 2 – The University of Kentucky’s healthcare science research goals are to solve local problems with a global impact, such as diabetes, obesity, drug use, and heart disease. To achieve these goals, the Kentucky General Assembly approved funding for a multidisciplinary health science research facility supporting wet labs. Yet through a highly interactive pre-design process, the design team guided leadership to expand the program to include a wider range of lab types and research specialties. The programming was adjusted to two-thirds wet labs and one-third dry labs and computational space. This major change allows scientists to work next to nutritionists, economists, and other researchers to tackle health issues from every angle. 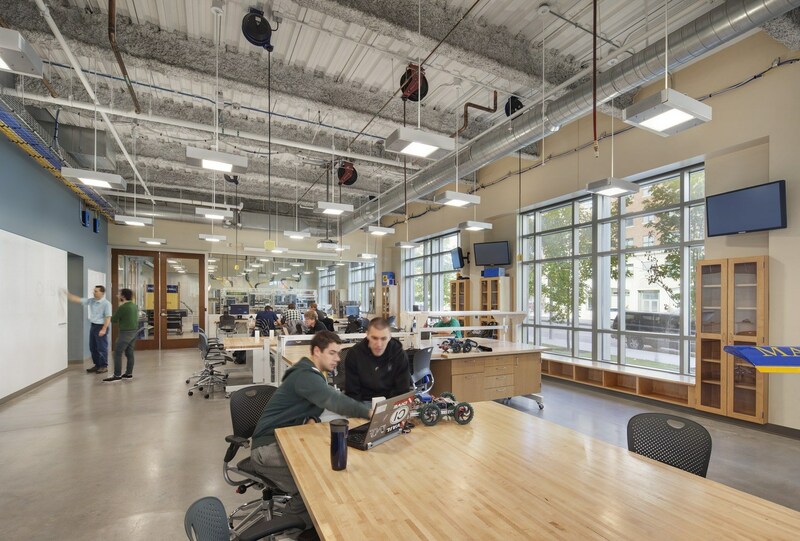 Marquette University Engineering Hall – Similarly at Marquette University, the Dean of the College of Engineering led a transition from a lecture-based learning model to a more hands-on pedagogy he described as “Discovery Learning.” Through a series of visioning workshops with stakeholders from the different engineering departments, the design team confirmed Discovery Learning concepts and developed a preliminary definition for Phase 1—the vision, guiding principles, space needs, project size, and schedule. Different departments, faculty and students now share resources in a highly flexible environment in the completed Engineering Hall—leading to potential new engineering insight through interdisciplinary collaboration. Phase 2, pending funding, will reflect lessons learned from Phase 1 and the ongoing process of Discovery Learning. To read more about planning science-based interdisciplinary learning spaces, download our exclusive Whitepaper: From Buzzword to Functional Building: How the Design Process Supports Interdisciplinary Sciences and Technology Learning Spaces in Higher Education.